is our delicious organic raw honey combined with fresh Ginger. Our Raw Ginger Honey can be used as a tonic food in place of plain honey or added to your favorite food or beverage that you already use raw honey in. Raw honey happens to be the only sweetener mentioned in the entire Bible making it the original sweetener. When the Israelites were looking for their promised land it was a land flowing with milk and honey! Ginger is acrid and slightly warm in nature. It enters the Lungs, Spleen and Stomach. 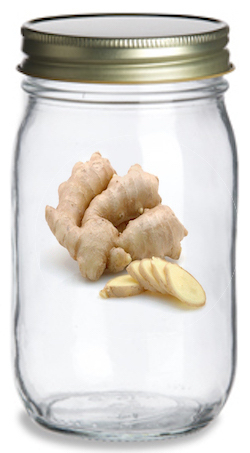 Ginger releases the exterior and induces perspiration to help prevent common cold and flu. Ginger warms and harmonizes the middle burner to alleviate nausea, vomiting and indigestion. Ginger warms the lung and stops coughing with phlegm. Ginger also eliminates toxins that can cause vomiting or diarrhea from food poisoning. Cautions & Contraindications: Ginger is acrid and warm in nature and can damage qi and yin. Do not use if you are yin deficient, have excess heat or have spontaneous sweating due to yin deficiency. Ginger should not be used long term since it may generate heat that accumulates. It is good to balance Ginger with a yin food such as Pineapple or Goji. Raw honey is produced by honeybees after they collect nectar from flowers and bring it back to their hive. Raw honey is an alkalizing food since it contains the components of the living plants it is collected from which are also alkalizing. Raw honey retains the properties contained in the plants it is produced from making it full of antioxidants. These plants pass on their antimicrobial properties as well. Although raw honey attracts water to the hair and skin when contained in hair and skin care products, raw honey is drying by nature when eaten and therefore can be beneficial to many people recovering from Candida and other forms of internal dampness. This double direction activity of honey makes it a tonic according to Traditional Chinese Medicine. Our raw honey is extracted from thriving hives, unprocessed, unfiltered and unheated. A high content of sweet wildflowers being foraged on increases the different sugars within the honey, which in turn explains the quick crystallization process. Since honey has its own natural preservatives nothing else is needed to keep it in its natural state. The only ingredients we put in our Raw Ginger Honey are Raw Organic Honey, Fresh Ginger and Love. Since honey has its own natural preservatives nothing else is needed to keep it in its natural state. This item is currently only available to Florida residents in our local delivery area or those visiting Florida in the same area.